Compassion and creativity are often the first casualties of conflict. But in Israel  where conflict has become a way of life  artistic expression sometimes still manages to transcend even the most brutal realities. Nothing illustrates this better than “There Must Be Another Way,” the song the Israeli public has chosen as this year’s entry to the Eurovision Song Contest in Moscow. With its message of peace and reconciliation, the song is an unlikely choice so soon after Israel’s deadly war in Gaza. But the subject matter is not the only thing remarkable about the ballad  so too are its composers and performers, Mira Awad and Noa. Awad is a Christian Arab Israeli, and her pairing with the Jewish Noa marks the first time an Arab has been chosen to sing for Israel in the most global of music events. The majority of Israel’s 1.6 million Arab citizens enjoy equal rights but rarely full integration into Israeli society. So the announcement of Awad’s part in the duo  made during Israel’s incursion into Gaza in December  is seen by many as a welcome symbol of coexistence at a time when relations between Arabs and Jews are especially strained. This is not the first time a member of a minority group will represent Israel at Eurovision. In 1998 Dana International won the competition with her song “Diva,” becoming the first transsexual to take first place. Soul crooner Eddie Butler  a member of Israel’s Black Hebrews  sang for his country in Athens in 2006, providing some priceless mass-media exposure for his tiny, little-known sect. But the pairing of Noa and Awad is a watershed event for both Israel’s sagging peace movement and its Arab minority, which represents 20% of the population. In the wake of the war in Gaza and Israel’s recent election of a right-wing government, the duet is a melodious reminder that Israelis from all sides “have no other option but to continue our dialogue towards peace,” says Awad, a rising stage and television star born to an Arab-Israeli father and a Bulgarian mother. 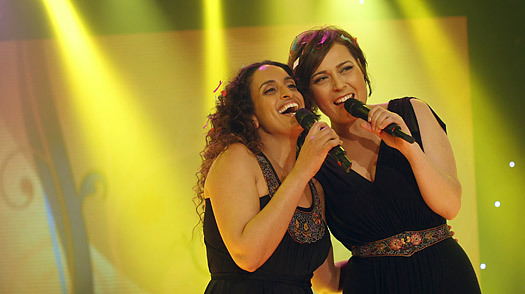 With both brouhahas now simmered down, Noa and Awad can focus on perfecting their harmonies. As for whether they will actually win in Moscow  as Israel has done three times since 1974  Awad is both optimistic and realistic. “I’m not dwelling on winning, because we are already making a mark through the message of our music,” she says. And if that message can take them all the way to the finals, so much the better. “At least that way we won’t embarrass ourselves,” Awad adds. See pictures of Eurovision’s most memorable moments. Read a TIME story about Eurovision in Russia. After Netanyahu: Where Does Obama’s Peace Initiative Go?